What do you do when a component to a piece of equipment breaks down and the manufacturer is either no longer in business and/or the part is no longer available? This is a difficult situation, especially if the equipment is vital to your business and you are faced with the possibility of either buying a new machine or searching for a used part somewhere, both of which are costly and time consuming. CAD Design Technology Can Save the Day! Often times, budget becomes a huge issue when a company is faced with the possibility of replacing a piece of equipment because parts are no longer available. Thankfully, with today’s CAD design software, it is possible to reverse engineer a component. Modern machining centers are able to reproduce the obsolete part by using drawings, 3D scans and actual measurements of the failed part, saving a significant amount of time and money. Milling turning technology, coupled with CAD design software and an experienced engineer, can reverse engineer the part, avoiding the unnecessary expense of buying new equipment. CAD Design – Saving History! Many collectors turn to modern machine shops with cutting edge CAD design for parts to restore antique machines. Restoring artifacts of the industrial age can be challenging. 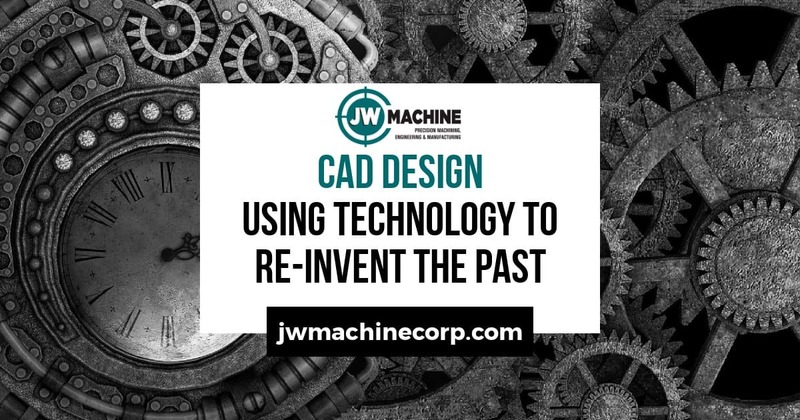 Machinists using machining centers and CAD design are able to reproduce missing or failed pieces of antique machinery to restore it to perfect condition, so they can operate just as they did when they were new. Do you have a piece of equipment that is down because the part is no longer available? Or, are you restoring an antique car or piece of machinery to operating condition and need a part manufactured? CAD design and state-of-the-art machining centers are the answer. JW Machine’s expert engineers and machinists can reverse engineer the part and restore your machine back to its original splendor. Give us a call today!